Beyond being purple and the birthstone for February, most of us would admit to not knowing a great deal about amethysts. Their beauty and popularity is as strong as ever but we’re happy to give you a full run-down of the facts behind this attractive purple gem. An amethyst must be carefully cut to give the gemstone a complete and even tone. Otherwise the violet colour that we all love within the gem can be uneven or not present enough to allow for a deep and powerful shade of colour. Amethysts are also transparent, so the setting is always important to consider. These gems are often cut into the traditional shapes and with standard cutting styles, such as ovals, pear shapes and rounds. But amethysts are also a popular choice for more daring and “freeform” shapes, such as crescent moons, fans and pentagons. They can also be used to create artistic cuts such as concave faceting (where flat facets have a concave shape). These “fantasy” cuts take advantage of refracted light to product distinctive and unique gemstones. There was a time when amethyst were considered as highly prized as rubies, sapphires and other precious gems. So what bumped them down to semi-precious? Huge deposits of amethyst geodes were discovered in Brazil during the 19th century, which changed supply and demand. This is why amethysts were used so commonly in royal jewellery (you’ll even find a few in the British Crown) up until recently because we’re living in a golden age of affordable amethyst jewellery! Large, central amethysts are popular in jewellery because the price per carat of an amethyst does not rise dramatically with larger sizes as you find with other gems. This makes them more accessible to purchasers, whilst still giving the impression of opulence and grandness. The image to the left shows a 19.20ct gem for less than £300. It is inarguable that, although their market value has decreased, there is still a great deal of mystique surrounding amethysts and their royal hue. Amethysts are one of the few vibrantly purple gemstones and you can get stones in a range of shades. As you might have guessed, you can find an amethyst that is closer to the blue tint or one that leans towards a deeper red, causing their shades to vary from violet to light purple. In America pink is considered not an acceptable colour for amethyst, though it is widely accepted elsewhere around the world. 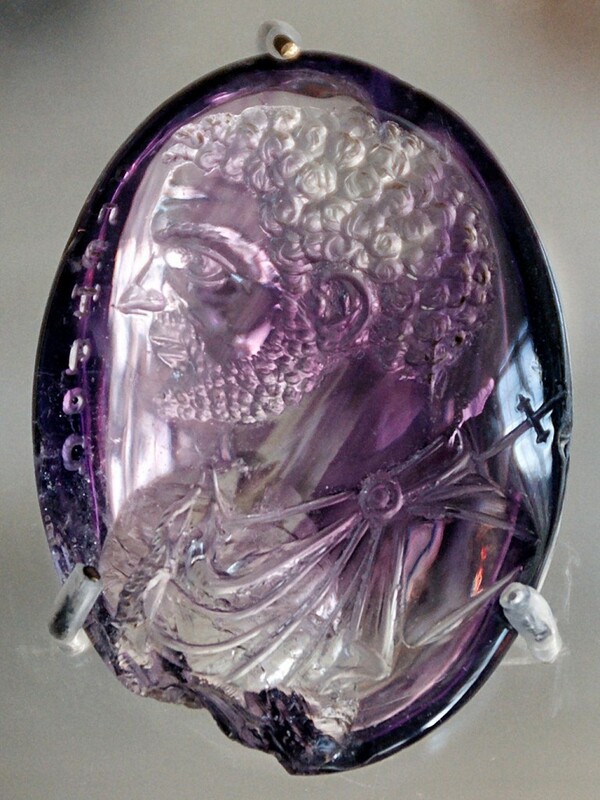 It is the colour that makes this gem so popular for setting in jewellery, extending back to the Romans (who we understand had a bit of a thing for purple….). The most desirable potential shade for an amethyst is a strong purple to red tone. A deep purple to violet colour is typically known as “Deep Siberian” due to their discovery in Siberia. Famously, Catherine the Great marshalled miners to seek out potential deposits of the gem, such was her desire for more. Darker violet and blue toned gemstones can appear black under poor lighting conditions so lighter colours are preferred to ensure that the signature colour is strong and clear. Colour zoning (patches of darker to lighter colour) will also decrease the value of the gem, thus the jewellery it’s a part of. Throughout most of history it was not known what made amethysts the vibrant shade of purple that has made them such a popular choice for jewellery. Today we know that it due to iron being present where the gemstone is mined, so you’ve learned something today! Amethysts lose their purple colour when heated, turning yellow. This change can also occur in sunlight so keep your amethyst jewellery protected during summer seasons. If you’re not interested in getting an amethyst set in jewellery then – luckily enough – history has given us many alternative uses for the gem. The Greeks were convinced that drinking from an amethyst chalice would stop you from getting drunk (we don’t advise you to test that theory) and gemstone therapy states that the amethyst is key to purity (including pure thoughts). European soldiers also believed at an amethyst amulet would protect them from harm on the battlefield (again, don’t test that please). Personally, we’re a fan of these gems set in beautiful items of jewellery. Who’s with us?